Owning a course’s textbooks is essential to passing most classes in college. When a professor types in the syllabus that a textbook is required for that class, it’s safe to say you won’t pass without it. The amount of time students are given to purchase textbooks before the first assignment that comes due isn’t very long, considering the first class lecture most likely happens the second or third day, if not the first. Some professors aren’t aware that some students, like myself, are waiting on financial aid to buy each required, expensive textbook. There should be an alternative way, such as supplying students with printed copies of the pages in the textbook that are needed within the first few weeks. Financial aid isn’t disbursed to students until a few weeks into the semester; which interferes with academic success, as lectures and/or homework assignments are based off of lectures. “It’s not really fair because if there’s homework assigned from the book, we can’t do it or study for the class until the financial aid is received and the textbook can be bought,” said Angela Farris, a general science major at American River College. Four out of the five classes I am taking this semester require me to have a textbook. It is the third week in the semester and I am still waiting on my financial aid. My planner shows three tests and quizzes coming up, but I still haven’t purchased any of my textbooks due to the late arrival of my financial aid. 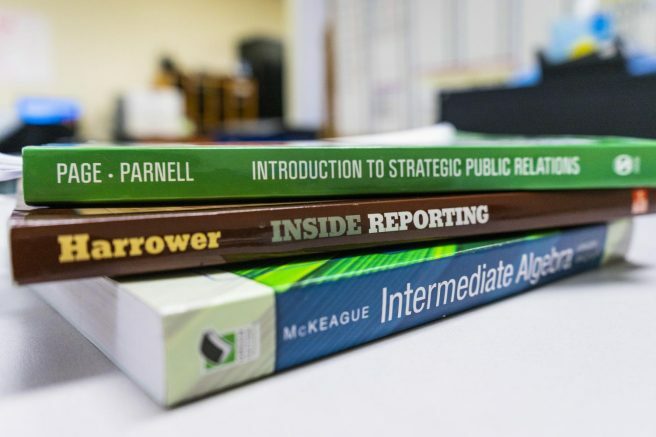 Most professors have their textbooks on reserve in the campus library, which can be very helpful, but can also be frustrating because there are only so many books available for that specific class. Professors should take the alternative route and have the syllabus available online in Canvas instead of printing it out for students, and instead use that paper to create a packet for students that includes the first few sections of the textbook, or even selected articles required for lectures and assignments. “I think if professors gave us a packet with pages from the textbook for the first couple weeks, maybe that would help us students who receive financial aid, but don’t get it in time for assignments,” said Quoquese Jackson, an English major. There is obviously no way for students to speed the process of financial aid, and because so many students receive it, I think it’d be best for professors to either wait longer until the first assignment, quiz, or test, or provide a packet with copied pages from the textbook for the students who need it. Alexis Warren is a third year student at American River College. This is her second semester working on the Current and first semester as the social media editor. Warren is a journalism major and hopes to graduate from ARC with an associate degree, following a transfer to California State University, Sacramento to then get her bachelor's degree. She plans to start her career as a celebrity/entertainment broadcaster soon after she completes her education. Be the first to comment on "Professors should consider the process of buying textbooks"